Cigarettes or Vaping: Which is Worse? Smoking Cigarettes or Vaping: Which Hurts Your Teeth Most? Most of us understand smoking is seriously damaging to your oral health in addition to your physical health. Many still smoke anyway, despite the fact they are no longer marketed and there is constant encouragement for those that smoke to quit. There are alternatives, of which vaping has become a popular option. Cessation tools abound in the form of gum, patches, pills, and even hypnosis. Most recently, vaping has become a controversial substitute. Today, let’s look at the consequences of both smoking and vaping in relation to your oral health, and try to determine whether vaping is a better choice. First up in our comparison of smoking to vaping, cigarette smoking. It’s been part of our society longer, so there is more statistical data to rely on. Bacteria: smoking harms your teeth in numerous ways, possibly the most detrimental being how it subverts the ability for your mouth to handle infection efficiently. Should you come in contact with an infection, your mouth has no defense, allowing bacteria to spread and virtually reside in your mouth to potentially cause severe problems down the road. Discoloration: the longer the bacteria resides in your mouth, the greater your exposure to the possibility of yellowing or staining. You may end up losing teeth, which will mean root canals. Circulation Challenges: bacteria in your mouth could also impede blood flow and oxygen from successfully entering your mouth. All the tobacco and grit you’re breathing in with your cigarette will physically assault your teeth, making you physically uncomfortable, but also weakening your enamel to bring on other challenges. More and more people are switching to vaping in the attempt to leave cigarettes behind forever, although there is still research in the works to discover vaping’s effects. Preliminary results indicate that vaping, at least, does not carry all the long-term negative effects known to result from cigarette smoking. Bacteria: nicotine and tar reside in the mouth for an extended period, at least until you brush your teeth and rinse, or stop smoking. Vaping does not share this consequence. There is no particulate component to vaping, so bacteria is less likely to form. The primary components of vaping fluid are water, propylene glycol and/or vegetable glycerine, and the level of nicotine is customized to individual taste, or can even be eliminated. Many add flavoring to add the taste, like mint, or fruits, even tobacco, if preferred. None of these have been determined to generate bacteria and/or mold. Discoloration: Nicotine and tar are the components that actually stain the teeth, so with vaping, the only determining factor is the level of nicotine you choose, since there is no tar in vaping. Consequently, vaping without a nicotine component will pose no danger to staining your teeth. Basically, the more nicotine content, the more susceptibility to staining. Those vaping without pure nicotine are believed to be at a much lower risk of staining their teeth, most especially because tar is not present as well. Circulation Challenges: bacteria causes circulation challenges. Vaping has neither tobacco or grit, and nicotine at optionally lower levels will reduce, if not eliminate, the risk of circulation issues. Some that vape experience dry mouth because the coil heats the liquid to produce the vapor, but ensuring you remain hydrated will alleviate any discomfort. Even though studies need to continue to determine the level of overall safety vaping offers participants, what we have determined is that without tar, and with the option to eliminate nicotine altogether, the two components known to result in gum disease and tooth challenges are not present. 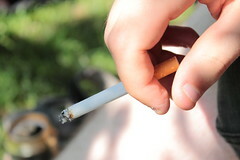 That’s without discussing the other addicting and harmful chemicals inherent in cigarettes. Only continued testing will get us the answers we need, but so far vaping appears to be a safer option. Is there a Correlation between Stress and Dental Health? Would Taxing Unhealthy Foods Incentivize Cutbacks? By site.dev2|2018-05-22T10:34:49+00:00May 17th, 2018|General Dentistry|Comments Off on Cigarettes or Vaping: Which is Worse? Can Consuming Alcohol Adversely Effect Oral Health?